Yep, winter is definitely here. We’ve been experiencing sub-zero temperatures at night with daytime highs in the teens and low twenties. We are glad in a way because soon Will can go over to our hayfield where 16 big round bales are sitting in a low area that got so wet with fall rains he couldn’t get the bales moved home. But we are thankful we are not experiencing the horrific events in California! Our prayers go out to everyone out there. Work has been slowed down by the cold. After all, it takes us about two hours to water the livestock, including the time it takes to drain the hoses, break ice, and drain the water line down to the well. Then there’s hand carrying water to the chickens, ducks, and goats. But hey, that’s winter in the north. Deer season is finished and David didn’t get a deer. He hunted two weekends down at his brother, Bill’s, hunting camp, but the only deer he saw were does and fawns. Only one of the guys got a deer. But we weren’t sad. On Monday, Will took our three big Angus butcher steers in to the processing plant. So soon our freezer will be full of fresh beef again and I’ll start canning it up — I can’t wait. We ended up with a quarter of beef “extra” as one of our buyers who had spoken for a half reduced his order to a quarter unexpectedly. So anyone in northern Minnesota who would like to buy a quarter of beef, speak up! The dining room table is stretched out and ready for Thanksgiving. 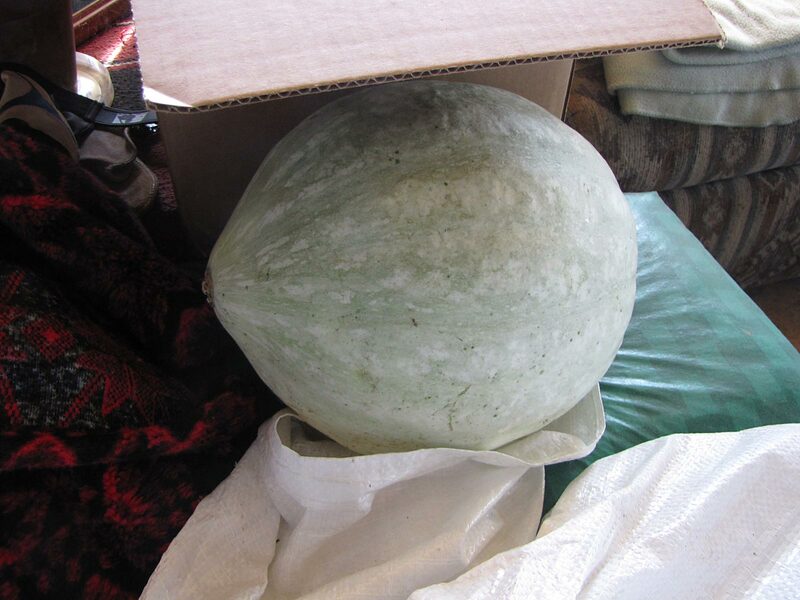 This is one of the big, fat Hopi Pale Grey squash I cut in half to bake. 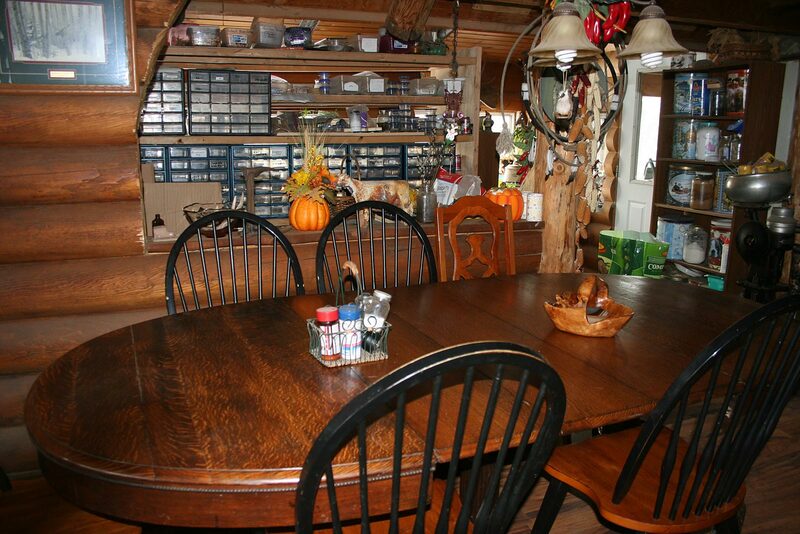 Today I’m getting ready for the family Thanksgiving feast and the dining room and kitchen are stripped bare and waiting. This morning I cut up two Hopi Pale Grey squash to bake for our traditional pumpkin pies. Of course, I first removed all the seeds to save. I had to keep an eye on Will as he kept sneaking some to crack and eat! The meat from the seeds beats a pumpkin all hollow, even raw. I’m sure the Hopi people used these big, fat seeds as food as well. I guess I’d better plant more Hopi Pale Greys next spring. Now the squash is in the oven baking, the eggs boiled for the deviled eggs, and the cranberries are thawing. I’ll be peeling apples for an apple pie and potatoes for garlic mashed potatoes. Two Jello salads join the feast along with some hot Half-time spoon rolls (recipe in both the Backwoods Home Cooking and Jackie Clay’s Pantry Cookbook). Darn, now I’m hungry and the turkey is not even in the oven! Have a very happy and blessed Thanksgiving. The kitchen just needs a little more clean-up and I will get to serious work! When you get your beef back from the processing plant, do you get your suet back? I use suet cakes often in the winter to feed the birds that stay around for a Michigan winter, but I’ve been considering making my own. I know I can pick up suet from the butcher, but I wonder if you use your suet this way, since I know you enjoy the birds too! Jackie I made a double batch of you half time rolls yesterday, that is now my favorite recipe too. And I have used it to make hamburger buns, I was so surprised at how they raised up so perfectly! Yes, I make buns, both hamburger and hot dog buns with this recipe. I love it! The laugh’s on me. I went to make the rolls for Thanksgiving dinner and my yeast was dead! Eeek! I’m sure I have some fresher yeast somewhere but I didn’t have time to find it so we did without but nobody noticed but me. You can bet the only place I went on Black Friday was the feed mill to get another pound of yeast. I’m sitting here at my computer, reading the news, sipping coffee, watching the snow come down in the mountains of Montana. The kids are still snuggled deep in their beds as I write this. (And I’m actually still full from yesterday’s feast:) ). It is lovely to read about your lives and the work you do. Thank you for your loyalty to this blog and your readers. Have a wonderful holiday with your family and loved ones. Thank you Elizabeth. I sure miss my Montana mountains!!! Happy thanksgiving to to and your family. Your making me hungry for jello salads. We are just finishing off the last one today! I love the snacking after the big feast! Happy Thanksgiving to you and your family! 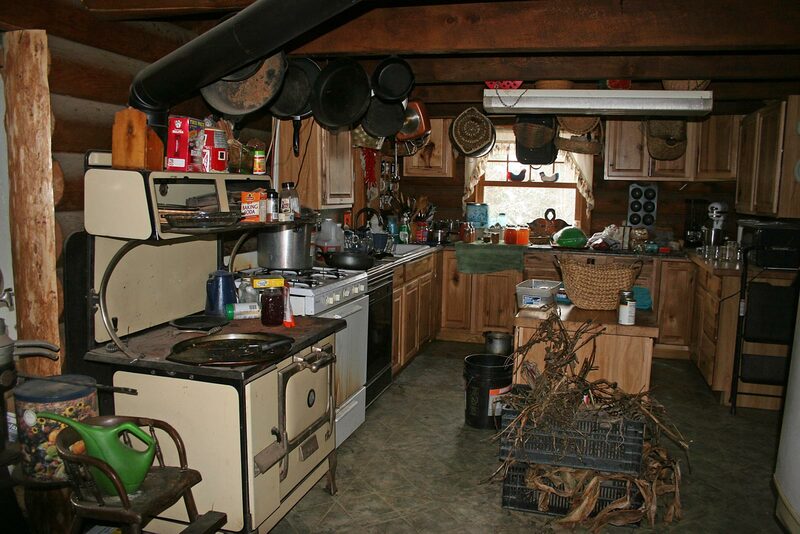 I love the homey ness of your kitchen, very warm and inviting. I love my kitchen too. But sometimes I call it my homey MESS. Happy Thanksgiving, Jackie and Will! Seeing your photos of the kitchen and table bring back fond memories from when I was fortunate enough to have been to two of your seminars. Absolutely LOVED my time spent up there, and never miss a blog you write. Many of us would go through a terrible withdrawal if the lights went out and our computers wouldn’t let us read your latest news! By the way, I made your pumpkin pie recipe, using last years pumpkin that was still in my freezer, and realize now I’ll need to double it next year cuz its So Delicious! No leftovers will exist to be sent home with my daughters, ha. We love having you visit us, Erin! Yep, I love Mom’s recipe for pumpkin pie but Will always insists I use Hopi Pale Grey squash instead of pumpkin. It really IS better. Have a great, happy holiday season! Jackie and Will: We hope your family has a blessed Thanksgiving. Your devotion to your blog, articles and books is a blessing to us all year long. I really believe that in the foreseeable future we are going to need the skills you are teaching us if our society keeps going the way it is headed. Thank you, Dwight. I believe, like you, our world keeps getting closer to the brink…crazier every day. I feel so blessed to be living way back in the woods. Some days do get hectic but I appreciate everything about our homestead. I live in sunny Florida. No snow, no ice, no frozen waterlines, no stock. But I remember reading that if you fill a bottle with salt water and throw it in your stock tank, it won’t freeze. Would love to know if that works; but, of course, have no way of trying that. Have you ever done that? If you fill a liter bottle with salt water and put it in a five gallon CHICKEN waterer, it won’t usually freeze. If you don’t live where it gets to -35 or so. It doesn’t work in a stock tank. Go pick some sea shells for me! I’m jealous. Many wishes for a Happy Thanksgiving! Thank you for taking the time to post here, when you stay so busy with the rest of your life. I always enjoy reading about what you’re up to. Yesterday, I canned mushrooms, using your canning book. Thanks for all you do. Mmmm mushrooms. I’ve got to pick and can up a bunch next spring as my stock is running low. They’re so handy…and tasty to have around! A very blessed Thanksgiving to you and your loved ones Jackie! I know your feast will be absolutely delicious and bountiful because of the amazing work you do! Thank you for sharing your life with us on this blog. It looks like winter has truly arrived in your neck of the woods! Enjoy! Thank you Robyn. Yep, it does look like it’s winter here…even though the calendar says “fall”. But spring is coming and we are already planning our next gardens! Happy Thanksgiving to all of you! Sounds like it will be scrumptious! We ate until we went into comas. Yep, it was good and we are still picking at the leftovers I didn’t can up. Jackie Happy Thanksgiving to you and your family! I have your cookbooks and both your cherry pie and apple pie recipe (of course your pie crust recipe too)will be on our dessert table. I truly enjoy your blog and I’m jealous of your log cabin:) Stay warm…cold weather seems to make choring alot longing but makes the house feel extra toasty. I’m sure your pies were perfect. Not because of my recipes but because YOU made them! You’re right; when we come in from outside, we fight over who gets to put their butts up against the wood stove. Happy Thanksgiving Jackie and family!